A couple of months ago, Amazon completed its first delivery by drone in the UK. From the time the order was placed to the customer having the box in their hands was a mere 13 minutes. You couldn’t get it any quicker unless the shop was next door. When Amazon began, it could deliver in a few days, then it became 48 hours, then “next day”, and nowadays in many areas, you can get a delivery from Amazon “same day”. Argos in the UK can even deliver over 9,000 different product lines within an hour, almost anywhere in the country. The demand for getting our goods fast is increasing, and retailers are doing nothing to stem that requirement; rather, they are fueling it with their increasingly speedy delivery systems. It all taps into the “I want it now” phenomenon, which the Internet itself has helped create. Just think what it must be like with a mere 2Mbps broadband, when you are speeding along with 24Mbps or more. Even at that speed, it will take you half an hour to download a movie. That frustrates you when you know that if you had 100Mbps you’d get the movie in less than a couple of minutes. Yet, 20 years ago if you wanted the same movie, you would have had to wait a whole week before it arrived at your nearby cinema. The faster we can get things, the faster we want them. Even people with 100Mbps broadband are annoyed with the 2-minute download for a movie when they know people with 1,000Mbps broadband can get the same thing in a handful of seconds. There is plenty of other evidence that people want more speed online. In my book, Click.ology, I discuss a study from Kissmetrics that shows for a one-second delay in loading of a web page, there is a 7% decrease in sales conversions. That’s seven out of every 100 visitors who cannot wait a second. A single second. Several studies also show that people expect almost instant replies to emails. One survey discovered that one in every 50 people who email a company expect a response within 60 seconds. Wherever you look, we want things fast. And the Internet is making us want things even faster. Even with increased download speeds, these days the average time we spend looking at a web page is just three seconds. Ten years ago it was 20 seconds. If we cannot find what we want NOW, then we move on. We have become butterflies. So what can be done about it? No matter what your business, the Amazon “Prime Air Delivery” will have an impact on your customers. They will expect you to be able to do things more quickly than before. They will want email response times to fall. They will demand faster delivery. Are you ready for that? Get the speediest website hosting you can afford. 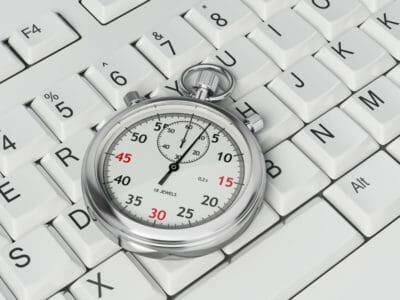 Check the speed of your website at GTMetrix and take any actions they suggest. Set in place an email system and processes. Instead of just responding randomly, you need a system that is productive, uses templates and which provides you the time to respond quickly as a result. Become more organised generally. The slowness of most business activities is down to lack of planning, the absence of processes and poor time organisation. You can no longer afford to get away with this. As more and more people use the Internet, they will be gathering more and more ammunition for the possibility that not only do they “want it now” but also that they can “get it now”. The desire for speed is an inbuilt psychological instinct to enable your body to process things with the least amount of energy so that you can store excess amounts for use in an emergency. It is part of our survival mechanism. So, people don’t just want speedy service and delivery from you because they want it; their brain is constantly driving them to need it. Starting a new business online requires much less risk than investing your dollars into a brick-and-mortar storefront or downtown office. Because your business is based online, you can reach more potential customers and work from virtually anywhere. With some basic website and communication skills along with a little maintenance know-how, almost anyone can launch a business online and get it up and running in only days. Think you’re ready to become the next big entrepreneur online?